There are a number of unusual things about visiting Korea, but one of the more amusing ones is the curious souvenir situation. The DMZ, on the North Korean side, feels surprisingly like a tourist trap full of t-shirts, candies, artwork, dear leader pins and more. It's a crime to actually purchase things there, at least as an American in the U.S. But there's a roundabout way where they will accept Euros and RMB for goods in tourist stops stocked full of their various dear leaders' translated thoughts on Juche, musical notation for the country's anthem translated to Russian, recipe books and colorful postcards, the latter of which I acquired many. They were all much more interesting than your standard touristic souvenir shop, partly because you knew this was quite literally the only place in the world you're likely to find these things, but also because you never knew quite what to expect, when you'd see a particular item again or what the price would be (In case you're curious, my one half-hearted attempt at bargaining was not well received. Not recommended). There was one "tourist moment" that stood out above the others though. Throughout the entire trip we were never entirely sure of our itinerary from one moment to the next, and my impression was neither were our wonderful North Korean tour guides. On one of the days its was announced we would have approximately 15 minutes to visit a real department store, exchange RMB or Euros for North Korean won and buy something. "We must ask that you change the money back, as you are not supposed to leave the country with our money. We will not check, but please exchange it," he told us. The funniest part wasn't the wink-nudge encouragement to acquire a more interesting travel memento — it was trying to take-in the interestingness of a North Korean department store, buy something, stand in-line for checkout and then pretend we were exchanging all of our money again in 15 minutes! I walked up and down the aisles, trying to figure out what to get. The 18,700 won frying pan? The smartphone running the DPRK-flavored version of Android sitting under the case next to chintzy jewelry? Would they even let me buy that? In a panic I settled on candy, a strange bottle of booze that I thought might look good next to the Žuta Osa my Serbian relatives gave me the previous winter and a carton of cigarettes. For context, I do not smoke or drink (I'm a bad Serb). 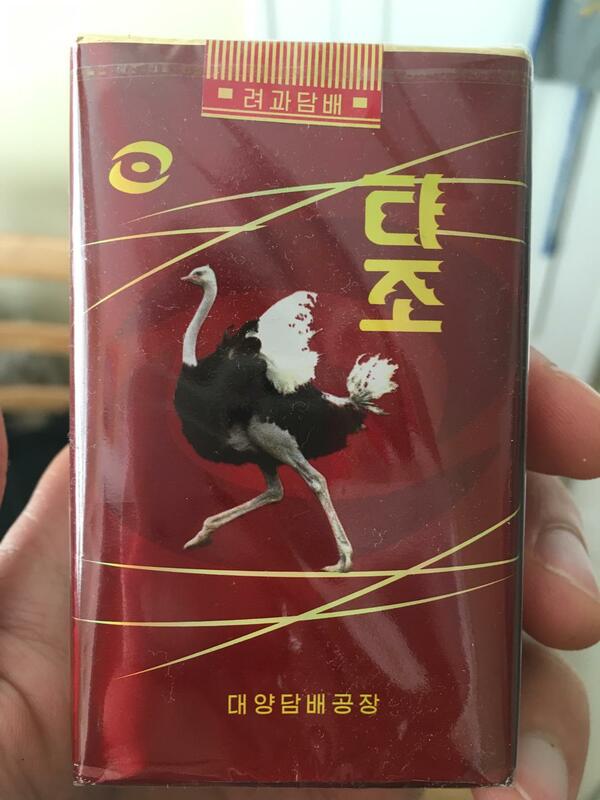 Many months later my red ostrich North Korean cigarettes sit on top of the microwave in my kitchen, relegated to the occasional gag gift and conversation pieces.